Interested in riding this alligator art bike for an upcoming parade or event? Please contact Katrina Brees at the Krewe of Kolossos at kreweofkolossos@gmail.com or use the Buy Now below. 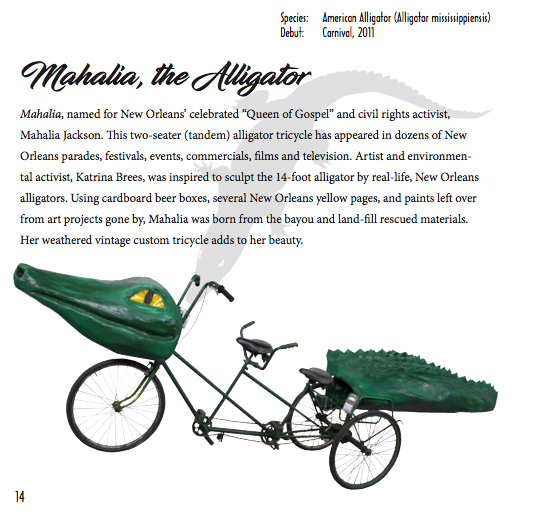 Mahalia, named for New Orleans’ celebrated “Queen of Gospel” and civil rights activist, Mahalia Jackson, is a two-seater (tandem) alligator tricycle that has appeared in dozens of New Orleans parades, festivals, events, commercials, lms and television. Artist and environmental activist, Katrina Brees, was inspired to sculpt the 14-foot alligator by real-life, New Orleans alligators. Using cardboard beer boxes, several New Orleans yellow pages, and paints left over from art projects gone by, Mahalia was born from the bayou and landfill rescued materials. Her weathered vintage custom tricycle adds to her beauty.